Our staff has helped thousands of people over the last 7 years not only to stop their pain, but also regain their health & improve the quality of their lives without the use of drugs or surgery. 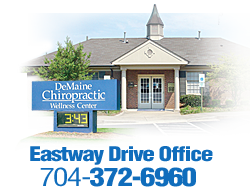 Our mission: to provide the best chiropractic care to hundreds of people of all ages in our community. Not only to eliminate their pain, but also to correct the cause of their problems. We use the latest non-surgical, non-invasive, gentle, safe & effective techniques to ensure long-term results.